Being a Maker’s Mark Ambassador has many benefits. Maker’s Mark inside info, discounts, free Christmas gifts and your own personalized barrel of bourbon. My name is Demitrius, and I am Maker’s Mark Ambassador #1545768. I can say without a doubt that the Makers Mark Ambassador program is one of the most innovative and incredible fan clubs of all time! Doe-Anderson, a Louisville-based marketing firm behind the program has created a one-of-a-kind program that everyone loves! Each year, Makers Mark sends out neat little Christmas gifts to its Ambassadors. 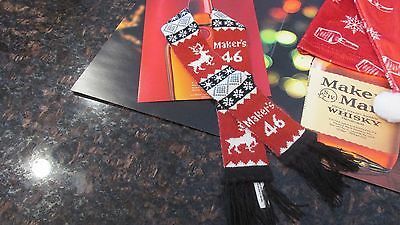 This year, Ambassadors received small bourbon scarves. This may not seem like much of a perk, but every year Ambassadors tear into their envelopes like crazed teenage girls at a Justin Bieber concert. This very special and unique perk makes being an Ambassador so much more fun than any other program out there provides. Every Friday I say that ‘there’s a barrel of bourbon with my name on it’. As a Makers Mark Ambassador, you can say that and mean it! When you become a Makers Mark Ambassador, you will have your name stamped into a personalized barrel plate. After you visit the distillery in Loretto (where you get a special ‘Ambassadors Tour’), you can grab a bottle of Maker’s Mark brewed from your own personalized barrel. Once your barrel has reached maturity, you can make the pilgrimage to the distillery to buy and hand dip your own barrel’s bourbon. Ambassadors have access to an ‘age-o-meter’ that lets you know when your particular barrel will mature. On top of barrels, Maker’s Mark offers its Ambassadors all sorts of unique personalized schwagg. You can get your own Makers Mark cocktail shakers, golf balls, plaques, and glasses – stuff you cant find or order anywhere else! If you are about that #BourbonLife , you care about what goes on behind the scenes at your favorite brands. In 2013, Makers Mark anticipated the coming bourbon shortage and made the unpopular decision to lower proof rather than raise prices or run out. Maker’s Mark Ambassadors were the first to find out. Likewise, when we as Ambassadors raised hell, the decision was reversed we were given a platform to suggest other ways the brand can cope with demand. 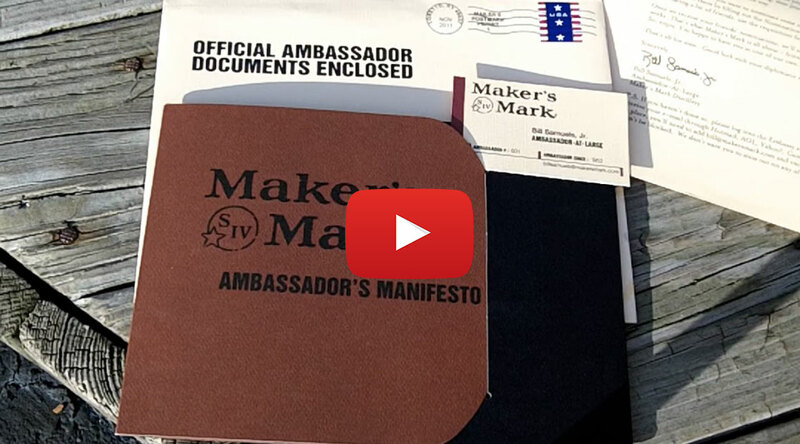 On top of inside information, Makers Mark sends its ambassadors invites to underground events and discounts. Not bad perks for a free program! Curious as to how you can become a Makers Mark Ambassador? Check out the short video below and get signed up to become an ambassador. Just a clarification. Your bottle will not come from your individual barrel but the batch in which your barrel was part of. Just to clarify a point….your bottle will be from the batch in which your barrel was included. HELP . . . I’m out of business cards. Are you referring to our business cards, or Makers? In 2011 I think we adopted a barrel of bourbon. When would this be ready for bottling? Howdy! According to their site, it takes 7 years before your barrel is ready! And as they say, good things are worth waiting for! Go to Maker’s website and log into your account. If you don’t know your user name or password, they will help you reset it and get the info you need. From there, tilt can find out the status of your barrel and when it will be ready to enjoy. Is there a fee or cost?